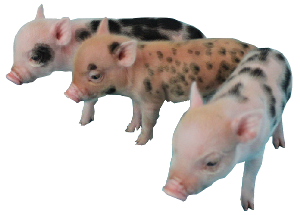 Juliana Pigs, also known as Miniature Painted Pigs, are small colorful pigs. They are lean, muscular pigs that originating in Europe through selective breeding of various kinds of pigs. On average the Juliana pig weighs between 30 - 50 pounds and is 13 - 15 inches in height. They have distinctive elongated snout. However, the main advantage of these pigs is the temperament - during breeding, much attention was paid not only to their conformation, but also to the character. They are cheerful, flexible, and not aggressive. Julian pigs are always spotted. Their main color can be silvery, white, red, black or coffee with milk. The spots are predominantly black, but they can be both red and white. The spotting should be dense, the contours of the spots are clear, the spots are scattered chaotically. The spots may fade somewhat over time due to the growth of the bristles, but they should be clearly visible on the skin of the animal during washing. Their bristles are coarse, thick, and quite long in winter.